All glories to our beloved guardians. All glories to Sripad Bhakti Kusum Ashram Maharaj. 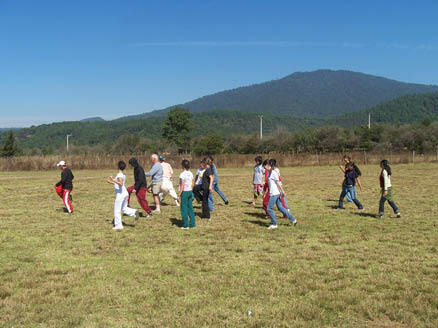 As an offering unto our beloved Srila Gurudev Srila Bhakti Sundar Govinda Dev-Goswami Maharaj and the Vaishnavas, we send the report about the glorious “XIII Camp for the Youth and Children” that takes place at La Palma, Michoacán, one hour away from Morelia, Michoacán, México. At last we have arrived! We belong to the community of Veracruz: Madhuchanda D.D., Arjjuna Prabhu, Mayeswari D.D., Sruti D.D., Tripti D.D. and from Orizaba Shanti D.D. and Yudhisthir Prabhu. From very early in the morning the few young devotees assembled started mangal-arati. Mario, the sports teacher, and the organizers of the camp programmed our activities and took us to the ashram, and from there to the football fields so we could start our classes. He taught us several movements of self-defence and teacher Mario was very good with all of us. We worked in teams and we were instructed about the importance of discipline in this type of physical activity. We paid much attention, but when it was time to play the role of the bandits or bad guys, we could not restrain ourselves from laughing due to our postures and gestures. After this class we went back to the camp and respected prasadam. We had mridanga classes which ended up in Gaura-arati. While the arati was going on, some devotees from Guadalajara arrived: Prabhu Nitai Charan Prabhu, Vamsi Prabhu and his younger sister Vishaka D.D., daughter of Pitambar Prabhu. We were all very happy; we greeted each other and sang with Sripad Ashram Maharaj. In order to perform our services, we divided ourselves in teams. We were five teams with our respective cheerleaders! This has become a tradition in this youth camp. Then we took prasadam and went to sleep. It is very beautiful to see again these god brothers and live this unique experience of being together in sankirttan offered to our beloved Sripad Bhakti Kusum Ashram Maharaj. Talking about topics also made us wish for service and go back to our homes with more devotional inspiration. This was the first day of regulated activities, this is, waking up at 5:30 in the morning, do mangal-arati, sing all the bhajans, read Sri Chaitanya-charitamrita, etc. Later on, we had prasadam and performed our respective duties. We were five groups each with six members and every group had to serve prasadam, clean the temple and wash the dishes or do some other service. Afterwards we had our karate class. Something new in this camp was the appointment of the daily midday program with the offering in the altar singing bhoga-arati giti and then 'Jasomatinandana…. ', etc. 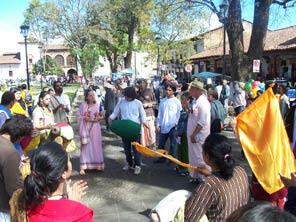 both very enthusiastic due to the participation of the devotees from Veracruz. After the opulent prasadam and the performance of the different services, all the young devotees had a class of devotional chanting, while the adults had a class on self. By the time of sandhya-arati every team would provide the pujari, and after Tulasi parikrama and the corresponding bhajans, Madhavi D.D. would talk about the message of the day and organize the activities for the next day. Maharaj or another devotee would start a special kirttan and it would not stop until it made everyone feel absolutely exhausted. The reward was first class prasadam and a very cozy fire camp; this would conclude the activities of the day and everyone then returned to their corresponding rooms, all awaiting the next day. All glories to Srila Bhakti Sundar Govinda Dev-Goswami Maharaj! 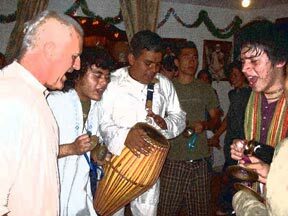 Nitai Charan Das - Community of Guadalajara. On this day the activities started by 5:30 a.m. and as usual the bell rang three times and Sripad Bhakti Kusum Ashram Maharaj would go to wake us up, that is: Rasamoy, Arjjun Krishna, Hari Gopal, Yudhisthir, Amal Krishna and myself, Gaur-Narayan. By 6 a.m. we were chanting japa and about 6:30 we started mangal-arati, parikrama, bhajans, and the wonderful class of Madhya-lila about Sri Chaitanya Mahaprabhu, this was given by Sripad Bhakti Kusum Ashram Maharaj. Later on, we went to honor Bhagavat prasadam. After breakfast, each team went to perform the corresponding service -- a different service each day -- the heaviest was doing the dishes. Madhuchanda D.D. from Veracruz always helped each team in the mornings. After our services, we went for the self. class and on that particular day the teacher taught us to spin in order to learn to fall on the ground when someone knocks you down, and it was very funny to see how each of our god brothers and sisters had to practice them. When the martial arts class finished, we sat for a while to talk and remember nice moments that had happened some time ago; then we had prasadam. Arjjun Krishna and Sruti led the kirttan and Rasamoy played the mridanga. By the end of the arati we honored prasadam. We had a short nap and then a bath in order to attend Nitai Charan Prabhu’s class who always told us about a beautiful Pastime of Sri Chaitanya Mahaprabhu. We all felt very happy after listening to him and we started the sandhya-arati. We sang for Tulasi while performing parikrama and then bhajans. Finally, we received instructions for next day’s Harinam. We ended up with Nama-sankirttan. Before going to sleep we started a campfire and we were talking, laughing, and looking at the starry sky; sometimes we saw a few shooting stars. Later on, we proceeded to sleep and gain energy for next day’s Harinam. Please accept my humble obeisances unto your lotus feet and to your all associates accompanying you at the majestic Sri Chaitanya Saraswat Math. Gour Narayan Das, 18 years old - Community of Morelia. All glories to Srila Gurudev Srila Bhakti Sundar Govinda Dev-Goswami Maharaj! All glories to all the devotees who organize this beautiful Vaishnava Camp for the young and children devotees. Let me tell you about the different activities that we did on this day. We started quite early in the morning, about 5 a.m. and got ready for Harinam. to be held by 9 a.m. Nadia-rani D.D. from Monterrey and I were helping the other girls to get ready. It is always a pleasure to help them wear their devotional clothes. Once we were ready, we went to have breakfast and then by 10 a.m. we went by bus to perform Harinam. Sankirttan and do collection in order to cover some of the expenses at the camp. Once we arrived at the city of Patzcuaro, we got off the bus and walked to the central plaza of the city and started singing. After some time, Madhavi Didi asked me if I could lead the kirttan and I felt very happy, so I did it. We stopped after some time and invited the people to participate in the chanting of the Holy Names (Maha-mantra). Then we started again with the chanting while going around the plaza. Sripad Ashram Maharaj invited those who were around us observing the chanting and dancing; he asked them to participate in the practice of this chant. He also explained the importance of this process in this era of Kali-yuga. When he finished talking, he led the kirttan and everyone felt very happy to see his enthusiasm and devotion for singing the Maha-mantra. Once Maharaj finished singing, we all started collecting some money for several hours; by the time we had to get back we were all very tired. Some of us slept in the bus and others continued chanting. When we got to the ashram we had the evening arati and the results of the collection were given. Later on, we all honored prasadam and some others joined for the campfire; the rest went to sleep and got ready for the next day. All glories unto you Gurudev. All glories to Sripad Bhakti Kusum Ashram Maharaj as well as to all the devotees who organize this wonderful event. I also offer my respect and obeisances unto all the young Vaishnavas who let me learn a little bit from them and who gave me their valuable association. Laksmipriya Dasi - Community of Reynosa, Tamaulipas. On this last day of the year, we had much difficulty getting up early for mangal-arati. While trying to face the cold, all the devotees got ready and sang with dedication and joy. During class, we remembered the wonderful Pastimes of Mahaprabhu, and after prasadam we divided ourselves into teams in order to perform different types of cleaning seva for the different areas: bathrooms, nat mandir, rooms, etc. Afterwards, the martial arts teacher taught us some defence steps, and elastic movements for the muscles. We were having fun trying to do the exercises and by the end of the class Prabhu Nitai Charan was waiting for us for the singing class. He taught us different songs and made us practice to sing better. When the class finished we had a short recess and then a bath. Later, we got ready and attended bhoga-arati; noon time prasadam was really good. We also had mridanga class with Rasamoy Prabhu, who learned to play from Sadhu Priya Prabhu. He taught us different mantras and taught the different positions in order to play better for Gaura-arati. We were all ready for the worshipping and everyone sang full of joy. At the time of bhajans, Madhavi Didi asked different devotees to lead, and they were very enthusiastic. During class, Sripad Ashram Maharaj expressed very beautiful feelings about all the devotees and about the organization of this beautiful program. He asked us to express ourselves and I think that night we all spoke from the heart thanking the program organizers and expressing the joy of being in the association of everyone. By the end of the class, the kirttan was full of mercy since Ashram Maharaj was singing and everyone started dancing while singing the Holy Names. We said goodbye to the old year with a beautiful kirttan that lasted more than an hour. By the end, the prasadam was so beautiful. We all congratulated each other, as it is customary in Mexico, and wished the best for all. In fact, it is not possible to describe in full the feeling of being with devotees; this is what really fills us with life and hope in order to serve your lotus feet, Gurudev. Thank you for distributing your mercy. Gurudev, thank you for letting us be in your association and next to Sri Sri Guru-Gauranga-Gandharvva-Nandanandan. Vamsi Bihari Das, Community of Guadalajara. We got up late, between 7:30 a.m. and 8:00 a.m. The arati was done and we had pozole and tamales from the previous day. We had breakfast and then the teams went to do their services. There was a singing class with ‘Anita’ and Gaura Kinkara Prabhu playing a harmonium. They taught us to warm-up the voice and afterwards we had sports class. The class was good and in it there were Sripad Ashram Maharaj, Gaura Kinkara Prabhu and all the girls and boys. We were a bit sore but in the end got to relax. Then we went to the volleyball court and Maharaj played with us. The team formed by Narayan, Yudhisthir, Shanti, Amal, and Gadadhar won three times in a row, yet they lost in the end. After this activity we rested. We had a class about Krishna’s Pastimes with Nitai Charan Prabhu, and then Gaura-arati. It was very good and very energetic, full of devotional ecstasies. When it finished there was a nice dinner with punch and bread. Then we went to the campfire and Madhavi Didi sent us to sleep. Shanti D.D. - Community of Orizaba. We started the day feeling very enthusiastic. Knowing that it was Ekadasi we started by chanting japa and continued with the program. That day was very good and the devotees in the kitchen cooked potato puree, a vegetable of potato peels - which was very nice - fruit, and golden peanuts. That was a nice day; we learnt and practiced the songs for Ekadasi day. Nitai Charan Prabhu had taught us a few days before, but this time Gadadhar Prabhu from Morelia, led the kirttan. There was a very beautiful song, and even though I didn’t understand much, Nitai Charan explained and told us about a few pastimes related to Ekadasi. The evening kirttan was led by Sripad Bhakti Kusum Ashram Maharaj and it was great. We all danced and everything sounded very well. I offer my respectful obeisances unto the holy feet of my divine master, Srila Bhakti Sundar Govinda Dev-Goswami Maharaj, by whose only grace I have been able to keep the fortunate association of the devotees on this day, day of Harinam. On January 3, 2008 we started chanting japa by 6 in the morning. It was difficult for most of all to get up early since we had had a late night by the campfire, yet we had no choice but getting up. On our own, we the boys did not make it to wake up. It was Sripad Ashram Maharaj who woke us up and there’s no way to not pay attention to him. So we got up and went to chant our japa at the temple. Afterwards there was Mangal-arati and we sang up to the 'vandanam' because we all had to get ready for Harinam. in Uruapan. Madhavi Didi gave us two hours to get ready with devotional clothes and by 9 in the morning we had for breakfast tasty chilaquiles. When we got to Uruapan we went downtown and started singing. At the very beginning it was a bit lazy, and everyone on the street was rushing to work; so they didn’t pay us much attention. After a while, at about 1 p.m., Maharaj started singing and then this aspiring servant, Gadadhar Das, tried to invite some people, and in the end it was good. The people started to gather around us and then Maharaj started singing. Obviously this attracted people and some of them tried to follow the chanting. Some girls and boys tried to dance to the rhythm and danced and sang while clapping. After a while, we stopped the kirttan and Ashram Maharaj explained what we were doing there. Many people became interested and Maharaj kept their attention while some people questioned him. Someone approached me and told me he knew about the Hare Krishna movement, but he had left the process some time ago. He said that he wanted to meet again with the Hare Krishna devotees. I told him that is where you see everyone’s sukriti and that he should attend the programs in Morelia. After a while we all went for collection and we dispersed in several zones. Arjjuna, Mayeswari, Rasa Moy, Vrindavan, and your servant Gadadhar collected good money. About an hour later it was hotter and even though we are not this body, we were very hungry; this was about 4 p.m. When we got together again I was starving and there was nothing to eat, but after a long 5 minute wait Madhuchanda Didi arrived with a box full of sandwiches. Obviously they were delicious and we had them with soda and chips. It was almost time to go back to the camp, so we returned and collected some more money. We chanted more and left Uruapan. When we arrived to the camp it was a bit late, almost 7 in the evening. We had a shower and did sandhya-arati, had prasadam and visited Lord Agni in the fire camp because it was very cold. In this way ended January 3rd, 2008. I offer my respectful obeisances unto the holy feet of my Divine Gurudev, Srila Govinda Maharaj, to whom I beg for his mercy in order to be able to serve him with faith and devotion, day after day. 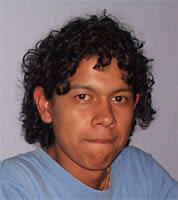 Gadadhar Das,18 years old - Community of Morelia. We woke up at about 5:30 in the morning to start the chanting of the japa, and by 6:30 and up to 8:00 a.m. we continued with the bhajans. After that, Sripad Bhakti Kusum Ashram Maharaj gave a lecture on Chaitanya-charitamrita and ended with Nama-sankirrtan by Srila Narottam Das Thakur; then all the devotees went to have a delicious breakfast in the form of prasadam, which satisfied all the young servitors. Then we proceeded to continue with the singing class led by Prabhu Gaura Kinkar. Later on, we went to the sports class with Teacher Mario; this was our last class on self. His wife Alma gave us a demonstration. Then we went to rest and to honor prasadam. Afterwards, the young section went to the mountain and had arati. The community of Veracruz was going to leave the day after. We had a kirttan led by Laksmi-priya, Gaura-kinkar, Krishna Prema-tarangini and Ashram Maharaj. The cooks served delicious dinner of zucchinis and strawberry, pineapple and cheese rolls, along with delicious chocolate, laddu and pie. All glories to Srila Bhakti Sundar Govinda Dev-Goswami Maharaj. We started singing our japa by 6 in the morning and around 7 we started Mangal-arati. We just sang a few bhajans because the devotees from Veracurz would go to Morelia right after. Some prasadam had been put in a bag for the Veracruz devotees, but they forgot it. Sripad Ashram Maharaj and Gadadhar Prabhu quickly went to find them and Nitai Charan Prabhu stayed back to teach us about Chaitanya-charitamrita. Later on, all the remaining devotees sat next to Ashram Maharaj to discuss organization of the camp. Some of the young devotees were very tired and they went to sleep, but we, Laksmi-priya, Nadia-rani and myself, were tidying the room and packing our belongings because we were about to leave for Bhagavan Prabhu and Subha-laksmi Didis’ house. So we cleaned the bathroom and left the bedroom clean. After some time we started to get our luggage out of the house and put it in the van. Since we didn’t fit in one, we split up, and someone gave us a lift to Santa Clara, a town close to La Palma de Sandoval. From there we took a bus going to Patzcuaro and we got there in about 20 minutes. Almost immediately we boarded a bus to Morelia that departed 5 minutes later. We waited for Amal Krishna, Narayan, Vamsi, Madhu Gopal and Gadadhar. On arriving at the bus station we asked for two taxis to go to Bhagavan Prabhu’s home. That’s what happened on the closing of the last day of the camp. Vrindavan D. D. - Community of Monterrey.